It's Moon Month at the Beginning Astronomy Class (Friday, March 18, 7:30pm). Well timed, too. I imagine there are a few new members who have had their first rush of Mooning and are curious what more there might be. Also, the Moon is at a very high elevation in the evenings - good seeing is often had this time of year. So here's a little homework for those who will be attending the class, and some useful stuff for those who Have A Life. If you're extremely cool and like .png better, just use that extension to the URL instead. For reasons I can't recall, there's also a .pdf there. Unfortunately it has some features marked - I'm sure you have better ideas of what to hunt down. Then again, those listed are not a bad start. There is plenty of open area, so if you make a bunch of copies you'll be able to mark stuff you saw and look it up later, or alternately look up interesting things and mark them on your map, then go hunt them down. Here's something I probably won't bother addressing in class: what kind of telescope is best? Okay, just kidding. The Moon has a lot of very high contrast features (most of them, in fact, because of the harsh difference between light and shadow when there's no air to scatter light). High contrast sharp lines are the easiest thing to resolve. Consequently, any well-figured telescope is fine. Any type. And of course, aperture helps because of the simple laws governing resolution. Some of the most noted Moon observers tend toward a 10-inch long-focus newt, but that's partly because they usually don't have much money. But worry not. All decent telescopes will do great on the Moon. I admit it is a nice luxury if it can track, but I also admit the very best views I've had were through my 12.5-inch dob. Go figure. Carefully. Do I need a Moon Rate if I get a tracking drive? No. Trust me. I don't even want to talk about it any more. Oh well, okay. 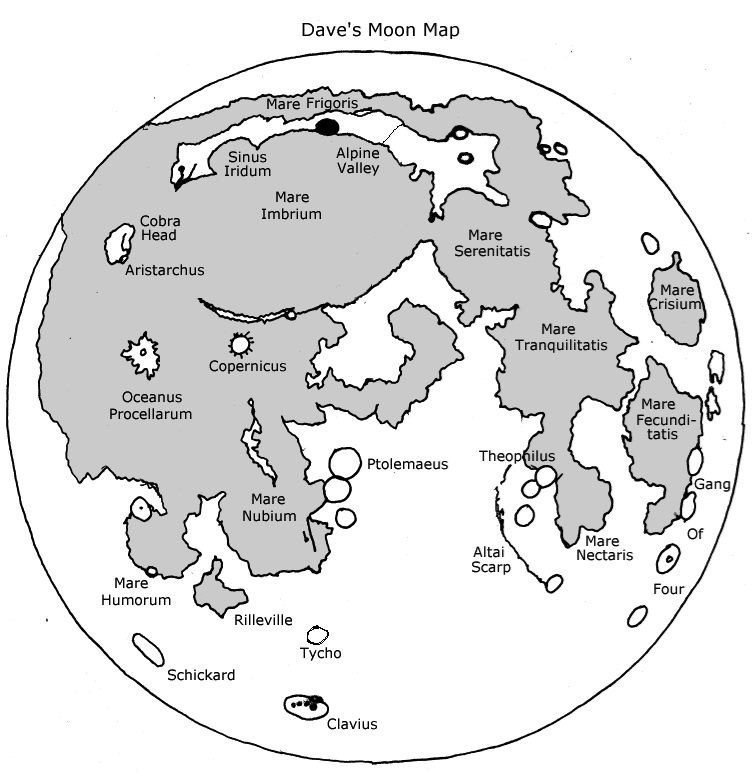 The Moon has (like all orbiting bodies) an elliptical orbit. During some parts of it's orbit it moves faster than others. A 'Moon Rate' is an average and you'll still get drift. But - even without it the drift is small enough to ignore easily. What about Computer Drives? They usually work great if you have one. If you don't, why bother? 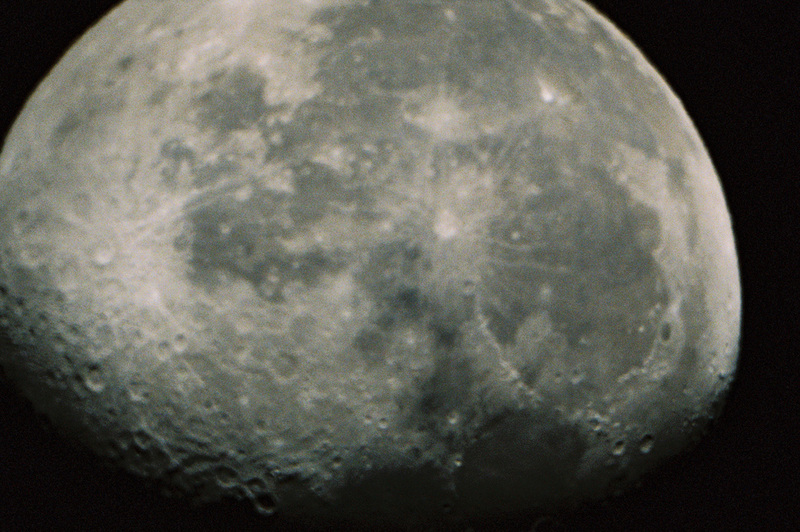 Another popular question: do you need a Moon Filter? No. It's handy when looking at the entire disk at low magnification at a public star party where people might be looking at other things. And a full-disk view of the Moon will be one of the most popular sights, so that's a consideration. But for personal viewing, no you don't. If that's all the magnification you can use that night, just take a bright light out with you so you don't get dark adapted and you'll find the view quite pleasant. When mooning at Mt. Wilson it's customary to leave the dome lights on. Folks can chat, read, play cards while waiting for their turn in line. Most of the time you'll be looking with as much power as the sky will allow, and if you get a good night you may find the view is too dim! So crank it up and skip the filters. Hmm. Some folks say color filters help them see more contrast, but that doesn't work for me. About the only thing that ever did was a single polarizing filter. They're very useful when viewing during the day and/or twilight because you can arrange the polarizer to minimize atmospheric scatter. Okay, I read the column. Should I go to the class? Last year I brought free candy.